For the past 10 years, Goughans Berry Farm in Caribou has created a six-acre corn maze on their property. This year, Mark Goughan said Tuesday, he and his wife Gloria Goughan, who own and operate the farm, were looking for a way to honor veterans for their service. That is how they settled on this years theme: "Amazingly Grateful." 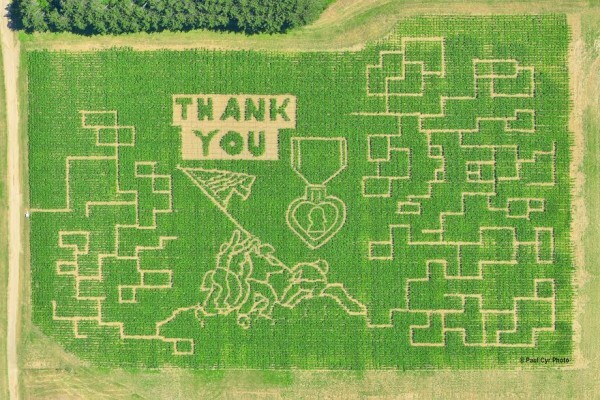 CARIBOU, Maine — For the past 10 years, Goughan’s Berry Farm in Caribou has created a corn maze in a 6-acre area, etching out a variety of shapes such as a moose, Maine Potato Board mascot Spuddy and the UMaine Black Bears logo. The maze depicts the raising of the American flag by five soldiers on Mount Suribachi on the island of Iwo Jima during World War II. It also has a representation of the Purple Heart Medal and a big “Thank You” to all veterans. “I think it is one of the most iconic photographs, and one that veterans appreciate and know that is one meant to honor them,” Goughan said Tuesday. A sign inside the maze also recognizes Marine Cpl. Dustin J. Libby of Presque Isle, who was killed in Iraq eight years ago. Libby was 22 when he was killed during a firefight on Dec. 6, 2006, while leading a squad of 12 men in combat operations in Ar Ramadi, Iraq. On his second tour of duty in the country, he was assigned to the 2nd Battalion, 4th Marine Regiment, 1st Marine Division, based out of Camp Pendleton, California. Mark and Gloria Goughan started the farm in 1976 and grow all kinds of crops, including potatoes and strawberries. Hayrides, pumpkin patch treks and other seasonal events as well as the farm’s homemade ice cream are popular with visitors. Goughan said that the corn was planted in mid-May in both directions so people can’t look down the rows for a way out. It also gave him a solid canvas from which to design his creation. Goughan sketches out his own creations on paper and then marks outs his corn field into 550 20-by-20-foot squares after planting. Around July 1, Goughan used a weed-whacker to cut the picture and trails out in the field while the corn was still 12 to 16 inches in height. It took him about 60 hours to cut out this year’s maze. Gloria Goughan is responsible for painting the signs that accompany the five different games that maze goers try to solve while walking through the maze. If you successfully complete any one of the five games, you win a free ice-cream cone. Mark Goughan stressed that corn mazes are examples of Agri-tourism, which combine the food production of a conventional farm with recreation that families can enjoy in a farm environment. It helps smaller farms diversify and also is a source of economic development in rural communities. The corn maze season saw a pretty good opening day on Aug. 30, according to Goughan, who said that he believes the traffic has grown at the farm over the years because of the maze and the other features. While overall attendance is dependent on the weather each year, 2,000 to 2,500 people visit the maze in a typical season. Fruits and vegetables are always available, as well as pumpkins of all sizes and other fall items. The animal barn also is open free of charge to children of all ages, and a merry-go-round is in operation on weekends. Last year, the farm added a nine-hole agricultural miniature golf course. The maze is open 8 p.m. to 4 p.m. Monday through Saturday and 10 a.m. to 4 p.m. Sunday. Group rates are available with hayrides to the maze or pumpkin field. For information, call the farm hotline at 498-6565.